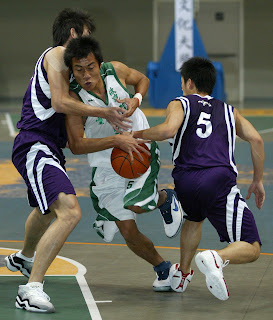 Taiwan Sports University (TSU), formerly known as National Taiwan College of Physical Education (NTCPE), shocked perennial power Taipei Physical Education College (TPEC) 87-76 Tuesday in the quarterfinal round of the 2008 University Basketball Alliance (UBA) season, snapping TPEC's 155-game winning streak. The winning streak, which spanned 13 years, was the longest in Taiwanese basketball history at any level. TPEC has won 12 straight UBA titles in those years. Senior Hsieh Tsun-fu made 10 consecutive free-throws in the final 1:25 to secure the historical win for TSU, the same school that had handed TPEC its last defeat in March 1996. TSU head coach Mai Tsai-cheng, the school's head coach in the last 13 years, said the upset victory was the biggest win in TSU basketball history. TPEC head coach Chen Chung-cheng, who also coached at the school in 1996, lamented the loss but said it was a good thing the pressure was finally released. It was not easy for any school to beat TPEC, which could almost get any high school player it wanted becausee of its location (Taipei City) and basketball tradition. Mai joked that TSU could only "get players other schools don't bother taking a look." Which was why beating TPEC has been always a motivation for most college players in Taiwan. And that showed on Tuesday. Hsieh scored 10 of his 16 points in the final two minutes. Pan Jia-hui had 24 points. Chen Pan-tse had 19. Wang Chi-yuan tallied 19 points and 15 boards. Chen Kuo-wei collcted 10 points and 9 rebounds. None of these players is on SBL team roster but they all played the game of their lives. Ironically, Taiwan Beer starting point guard Chen Shih-nian had his first career triple-double -- 11 points, 10 rebounds and 11 assists -- in TPEC's shocking defeat. Yulon starter Lu Cheng-ju had 28 points. Taiwan Mobile forward Hsu Wei-cheng had 14 points and 15 rebounds. Technically, the loss would not cost TPEC anything though. The quarterfinal round adopts a round robin format, meaning TPEC is still capable of winning its 13th straight title.